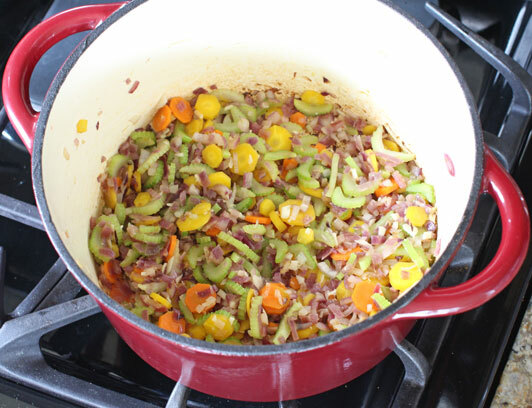 This recipe makes a big pot of delicious soup. 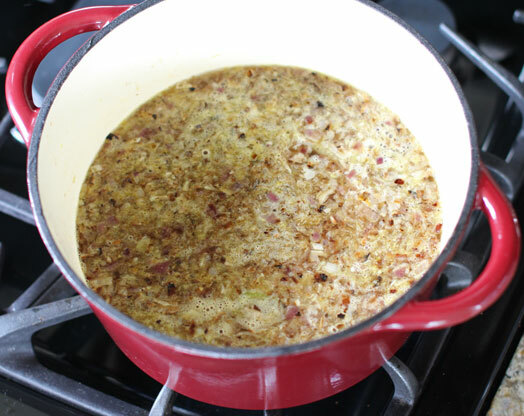 I recommend an enameled cast iron pot if you have one, because the onions caramelize so nicely, adding extra richness to the broth. However, the magic ingredients for me are the fresh rosemary and thyme. While you may choose to experiment with different veggies in this recipe, the fresh herbs add an eye-widening boost of flavor that really makes it special, so I recommend leaving those in the mix. 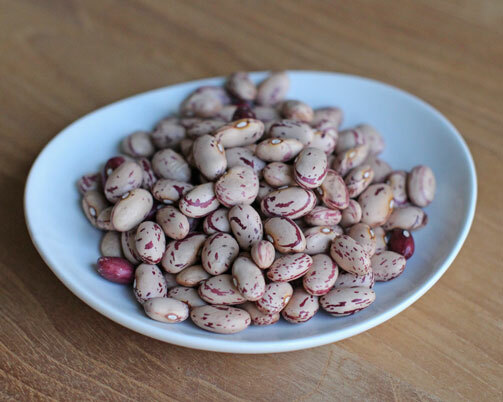 Unless you’re using canned beans, the night before you make this recipe you may want to soak 1 cup of dried cranberry beans (or other beans – cannellini, kidney or pinto beans would work well) in a bowl of water. In the morning, rinse the beans and cook them for about two hours with a piece of kombu (kelp), which will impart some minerals and may help with digestibility. I use my VitaClay Multi-Cooker, which I love because the interior container is made of clay instead of questionable non-stick materials. It cooks perfect beans every time and requires very little oversight. One cup of dried beans yields about 3 cups of cooked beans, so save your extra cooked beans for a quick veggie stir-fry later. One more very important note: Always sort your beans and lentils before you cook them, to make sure there are no stones in their midst. 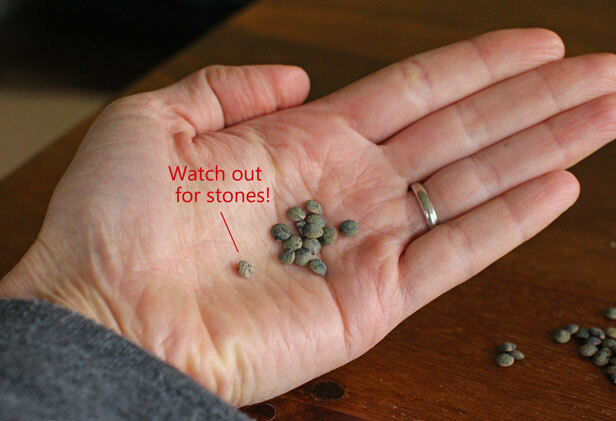 Be vigilant, because sometimes the hidden stones are the same size as the lentils and they could easily break a tooth. Check out this photo below for an example. It’s not uncommon to find one, and they sometimes look similar to the lentils! Heat 2 T. of olive oil in a large pot (preferably enameled cast iron for the way it caramelizes the onions so nicely) over medium-high heat. Sauté the diced red onion until it begins to soften. Add the 3 thinly sliced carrots and 3 thinly sliced celery ribs. Stir occasionally until they begin to brown. Add the minced garlic and shallots and stir for a minute more. Add 6 cups of water and bring to a boil. Add two of the chopped tomatoes. Simmer until all the veggies are soft. 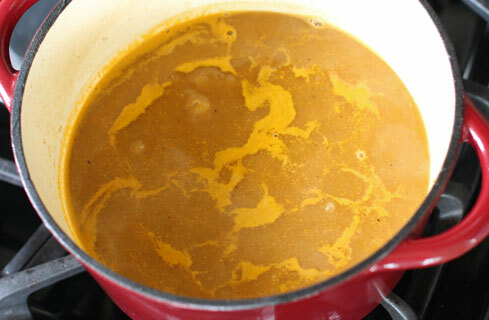 Blend with an immersion blender to make your broth. 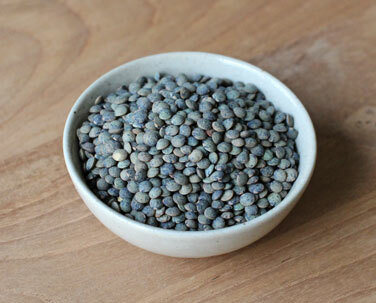 Add the 1 cup of French green lentils, another cup of water and 2 tsp. of sea salt and return to a simmer. If you soaked your lentils in advance, you can move directly to the next step. If you did not, give them a 5-minute head start over the rest of the ingredients. 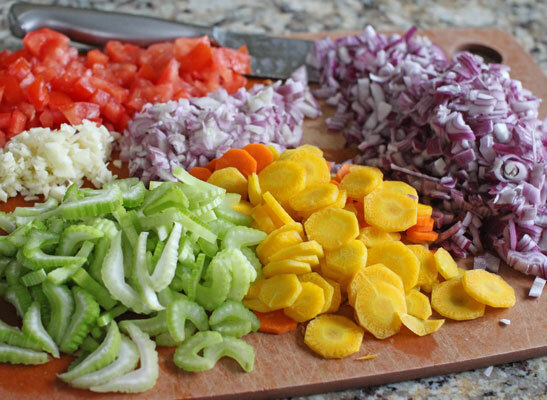 Now you’ll begin adding your soup veggies, which have been cut into thicker chunks to hold up through cooking. 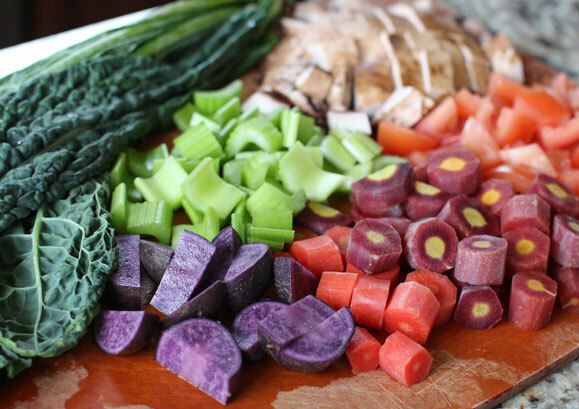 Look at the glorious rich colors of these ingredients! Start with the potatoes. Then wait a few minutes and then add the carrots and celery. Wait a few more minutes and add the last tomato and portobello mushroom. Add the sprigs of fresh rosemary and thyme. You can leave them on the stem, because you’ll pull them out at the end (although some of the leaves will come off, and that’s perfectly wonderful, too!). 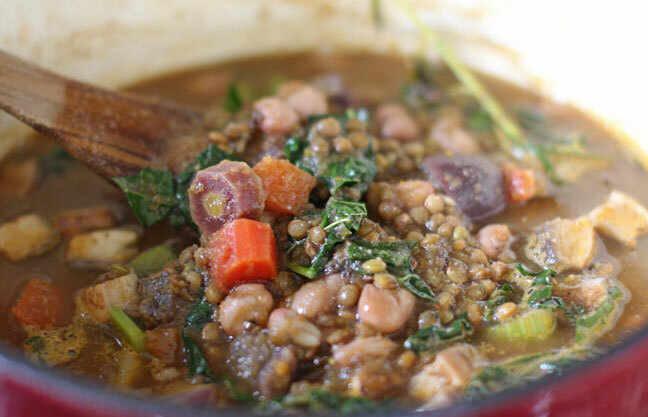 When the potatoes and lentils in particular are soft enough to eat, which should take about 15 minutes, then add the cooked beans and kale leaves, and allow them to simmer until just heated through. 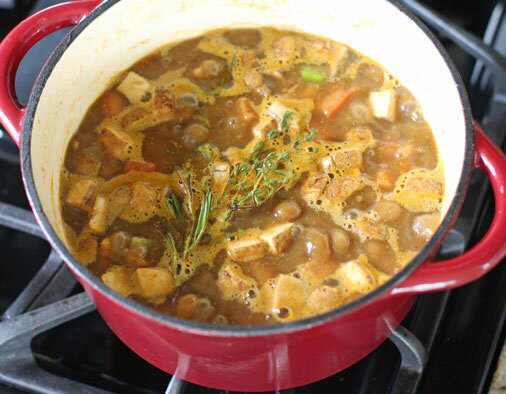 Taste the stew and add up to another tsp. of sea salt, to taste. Remove the rosemary and thyme stems, and this is ready to serve! A slice of rustic whole wheat bread makes a great accompaniment. Leftovers keep well for a few days in the fridge. 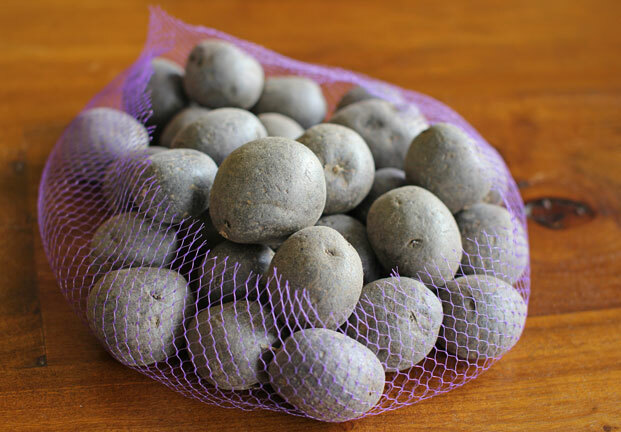 Aside from being beautiful, purple potatoes are rich in the immune-boosting antioxidant anthocyanin. And like all potatoes, they are naturally high in potassium and dietary fiber, and provide some nice plant-based protein, too. Kale is a nutritional powerhouse, and a good source of calcium, iron, folic acid and vitamins K, A, C and B6. It is reported to be effective at preventing certain cancers and reducing inflammation, as well as boosting the body’s detoxification mechanisms. French green lentils are dinner plate all-stars. When people ask you where you get your protein, you can tell them that these little beauties pack 13 grams per quarter cup. They also deliver a healthy dose of folate, iron, phosphorus and potassium. Pretty marbled cranberry beans provide another 10 grams of protein per quarter cup. They’re also a good source of calcium, dietary fiber and iron. *Some of the links in this post are affiliate links, which means that I’ll receive a small commission if you buy something through my link. It’s a great way to support Green Sage if you enjoy these recipes. But please understand that I only link to products that I sincerely believe in and recommend. 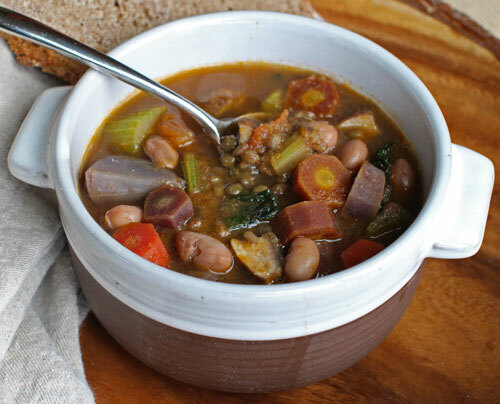 6 Responses to "Vegetable Lentil Stew"
Looks delicious! Looking forward to making this for Ian, he loves lentils! Thanks for the recipe! Right on! Glad to see you’re back to the blog! 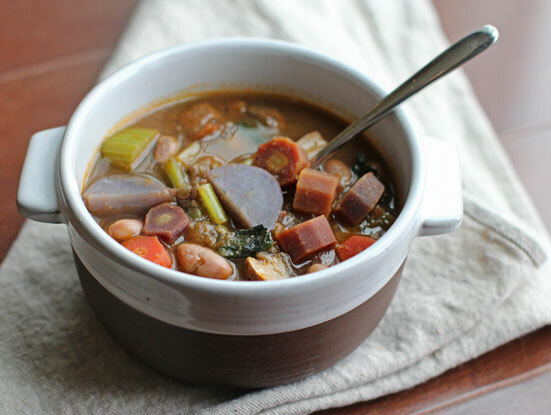 Beautiful stew–especially with those pretty carrots! I read about the clay cooker–sounds like an item to look into! Although I was surprised to read that the manufacturer recommends cooking seafood in porous clay…just seems like asking for trouble! Love to you, Stefanie. I’m going to look into getting one to replace our teflon-lined (!!!) rice cooker. I usually use the pressure cooker for rice, but sometimes it is handy to press a button and have the rice take care of itself…this looks like the solution! Thank you! Also–harvesting tri-color carrots this week…great timing!